Jesus Christ calls the African American Community to share the richness and warmth of our ethnicity, cultural values, and deep spirituality with the entire Catholic community. We are united with other Catholics by our common faith, shared hope and mutual charity. Our Lord has called us to proclaim the good news and with the guidance of the Holy Spirit we will answer that call as fully integrated members in the Roman Catholic faith. Did you know? 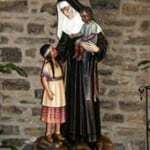 November is Black Catholic History month. Click here for some fun facts.